What a load of crap-pie! 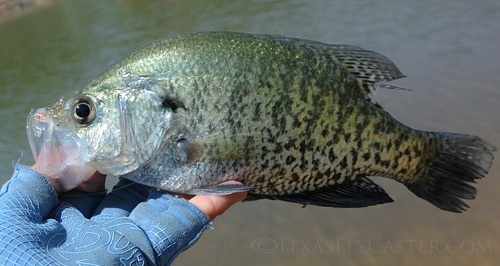 The crappie are plentiful on Lake Nocona, Texas, as are largemouth bass. Check back this coming week for a detailed report for fly fishers and some Texas History for non fly fishers. It all started a couple of weeks ago when my significant other thought she heard a water leak. Digging the new water line ourselves, or having it dug by our plumber was a numerical no-brainer – $300. we dig, $1200. he digs. Along the way my shovel ready significant other, digging oh so shallowly, cut our Verizon FIOS line. Not chewed, not frayed, no it was cut clean just six inches below our organic lawn. A few days with no TV or super high speed “interwebs” was followed by a temporary top of ground wire running from across the neighborhood street to our side of the street and to the house. We were connected, but it’s pretty embarrassing when the only line in the street leads to our house. Finally, after multiple calls, independent contractors show up to bury the line. Suddenly, they tell me the line had just been jerked free of its splice and of course that’s not their department. They said they would call the crew out to do that job. Two more days disconnected follow – to and through this day. Not only did the disconnect do a number on work, it also did a number on the fish communiques. So what’s been happening this week? First, let me start with the last, and say if you are texting me looking for tips and / or hotspots, you can give it up. Here’s the word – GO SOUTH where it’s a little warmer and maybe you can find a place to escape this incessant wind as well. Conditions from where I sit (alongside the Chisholm Trail and near the Red River) are windy and remarkably cool and will probably continue to be erratic through the next couple of days. SATURDAY – I am a bit hesitant to recommend you make a run to Lake Fork for the kayak fishing tournament with the weather conditions changing so drastically in the last two days. Weather looks to be smoothing out, but it will still probably make fishing difficult in a tournament setting on that lake. Still Working – I have all the pieces of a story on Lake Nocona and a visit to the end of the road – Spanish Fort, Texas. Now that I have some down time from work, I will pull all that together, and (with internet connections willing) get that out in two parts beginning Monday. It’s a heck of an adventure, not one to set any worlds on fire though. Think of Nocona as a place to go on a nice Sunday with a pace like you’re going to church. LOSS – Levon Helm died this week after a lengthy battle with throat cancer. This loss is hard to measure. He was a vital part of my music scene the last few years, and sparked a deeper interest in The Band and that volume of work. Thank you Mr. Helm. And lest I forget, I was asked to take a look at a pond last night to do an “inventory” – see what it had. It’s an older pond and my friend who owns it built it, so he knows the contours and what’s gone into it. The question is; what’s still in it? I know, it’s a tough job, but someone had to do it. If I can come up with some photographs after the weather warms to normal, I will detail this expedition for you. Believe me, it looks like an expedition – to Africa – where this pond is located.